1. In: We start of with a lush ambient number with a nice drone throughout & ethereal voices coming out of the darkness. There is not a whole lot of substance to it but it is the kind of ambience that draws you in & that you can easily get lost in. 2. Circles: The more percussive circles has the same droning ambience in the foreground but has some tribal beats in the background. Nice to have it that way a round so you have to focus to feel the beats. The beats seem steady but under closer inspection evolve slowly gaining more energy & they really feel like they are building to something. What it actually builds up to is a sonic downpour of ambience! The sounds in the end of this track really feel like the pouring of electronic rain on a cold dark winter day. 3. Whole Pulse: Circles seamlessly slips into this whole pulse & it really lives up to it's name. The drone pulses slightly giving this ambient movement. The cold wind that blows behind the drone is so real that I actually get chills listening to it. That really is all there is to this track which you think might be incredibly boring as it goes on for 17 minutes but amazingly I stay interested throughout the whole duration. The tone of the drones moves up & down just slightly enough to jolt the brain waves & the wind changes ever so slightly into a more solar sound and right at the death becomes a more high pitch fire in the darkness. It keeps pushing at the membrane but in a nice relaxed way that makes this a very dreamy sleepy track. 4. Language of Silence: Seamless again into this track. Very much a continuation of Whole Pulse but has a little more going on. Sounds buzz & twinkle in this track, under the drone seems to be life in the outer reaches of nothingness. In the vastness of space between planets there is not much but in this track there seems to be at least single cell life. Something that the light bounces off of. A very nice floaty track, feels like I'm orbiting a huge star at a distance of over 100Au. So just in the distance can I see one light just brighter than the rest, but not obvious. Very cool Spacey ambient. 5. Sights: A slightly more melodic track to finish with, with soft squelchy oscillating synths & a really bright atmosphere. I feel like the long journey through this alien space has suddenly come to it's final stage. We have passed through the out reaches of deep space between worlds, passed the outer & inner solar system & are now entering the suns corona but rather than the hot fiery death you might expect we are treated to a soft warmth surrounding us as we float around the star. The striking synth sounds that oscillate upwards feel like solar flares off to each side of my journey. A wonderful bright way to finish this journey through spacey ambient sounds. 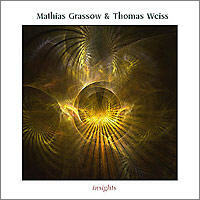 "On Databloem´s Practising Nature sublabel comes another new release from Germany’s Mathias Grassow and Tomas Weiss. Their Conscience CD was an excellent purely meditative CD, and Insights is equally good if slightly more active, though only relatively speaking. There is a surprisingly playful bouncing bass line in the undercurrent of “In,” the first track. But even the bass line is used in that repetitive, hypnotizing fashion that epitomizes Grassow’s style. More surprising is the appearance of sequencing as “Circles” fades in. Still, a choir hangs in the air saying “ah” into infinity, so this is still deeply trance-inducing stuff. And the loop is not your typical Berlin school fare, it has a quirky tribal yet modern percussive quality to it, very cool indeed. I still don’t know how they do it, picking a simple tone or phrase and making it so warm and soothing that it seems to echo forever, and you want it to. “Whole Pulse” arrives on a single drone after the various elements of “Circles” are gradually stripped away over its final minutes. The drone pulses slowly, and has a string sound that lends an orchestral feel, but it is a dark minimal symphony. Whereas “Circles” slowly evolved into distinct movements, “Whole Pulse” is only slight variants on itself over its 17 minutes, and as usual that’s just fine, perfect for contemplation or just tripping out. Brighter shimmers of sound herald “Language of Silence,” which adds just a bit of grit in the form of soft buzzes over the warm drones. Synthetic night sounds, almost alien, punctuate the air at the end. “Sights” is lighter than the rest, dreamy and ethereal, with gentle tribal elements as the disc draws to a close.